You may remember a competition I ran a little while ago to win a set of Crawlerz safety romper suits. 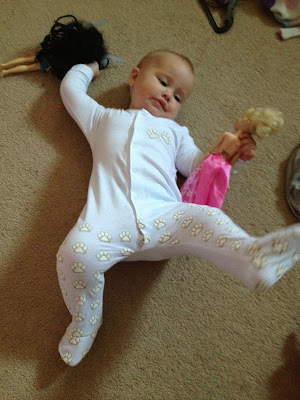 Since then, Crawlerz have kindly sent me one of their rompers to try out and review. Now incase you haven't heard of them or are just wanting to know a little bit more about them, I will do my best to explain. Crawlerz are rompers that have safety in mind. Made in sizes 3-6 months, 6-9 months and 9-12 months, they are designed to encourage your babies to crawl in a safe manner. They have unique anti-slip safety grips down the legs, toes and underfoot which are in the shape of paw prints. These not only give protection for your little ones, they also make it more comfortable for them whilst they are crawling around on different surfaces. I was sent one of their rompers in their unisex white colour but you can also purchase them in pink and blue too. Made from 100% cotton, Crawlerz are lovely and soft and feel like they have a little bit of stretch to them. I was accidently sent size 3-6 months, now I didn't return it because I thought I would pass it on to my cousin's baby once I had finished reviewing. Now either Layla is really small or these come up big because Layla is 13 and half months in this photo and the romper just about fits her!! Fairly easy to put on, there are poppers to do up down the centre of the romper. 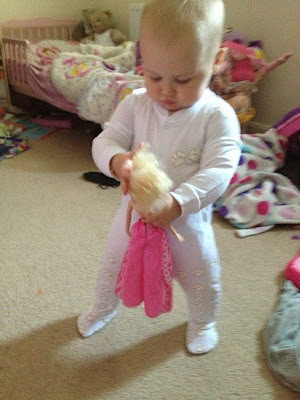 We have laminate at home and the romper definitely helped prevent Layla from slip sliding around on the floor. Layla in the past couple of months has started walking around and the ant-slip grips on the underfoot really came in handy in helping steady her without the need for putting shoes on. Crawlerz are currently on sale for £9.99 each. Not only do they look cute and funky, they help your child to move around safely, which I think in turn helps build your little ones confidence as they will have less accidents to scare them. I would really love it if they were to make these in bigger sizes, 12-18 months and 18-24 months would be great, many little ones are still crawling around at these ages. I would also like to see a wider range of colours available too. Overall I would recommend these to others, anything that provides extra safety for my child is good in my eyes and I feel they last beyond the crawling stage, they also help when it comes to cruising and walking too, so you get your moneys worth from them.